Target 7c of the Millennium Development Goals (MDG 7c) aimed to halve the population that had no sustainable access to water and basic sanitation before 2015. According to the data collected by the Joint Monitoring Programme in charge of measuring progress towards MDG 7c, 2.6 billion people gained access to safe water and 2.3 billion people to basic sanitation. Despite these optimistic figures, many academics have criticised MDG 7c. 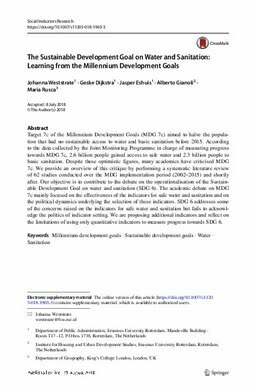 We provide an overview of this critique by performing a systematic literature review of 62 studies conducted over the MDG implementation period (2002–2015) and shortly after. Our objective is to contribute to the debate on the operationalisation of the Sustainable Development Goal on water and sanitation (SDG 6). The academic debate on MDG 7c mainly focused on the effectiveness of the indicators for safe water and sanitation and on the political dynamics underlying the selection of these indicators. SDG 6 addresses some of the concerns raised on the indicators for safe water and sanitation but fails to acknowledge the politics of indicator setting. We are proposing additional indicators and reflect on the limitations of using only quantitative indicators to measure progress towards SDG 6.